Corona del Mar is an affluent area of Newport Beach, California. South of the main harbor, CdM has beautiful, jagged coastline that puts its beaches among the best in Southern California. A lot of the best coastline is difficult to access here, as there’s almost no public access between Crystal Cove and Little Corona Beach. Instead, it’s just a series of ritzy houses (including my new ultimate dream home). On New Year’s Day, I headed out to Corona del Mar to meet up with Bill McIntosh, who had previously tracked down the elusive Arch Rock at Corona del Mar. You might think “elusive” is an exaggeration given that Arch Rock is clearly marked on Google Maps and it’s only a short distance from Little Corona Beach. Bill had already scouted the location and found the correct spot. When I arrived, I made the same mistake as so many others, assuming the first Arch Rock was it. I called Bill wondering where he was, and he advised me to keep walking. Part of me wonders whether Bill’s New Year’s Resolution was “death by ocean,” as getting out to Arch Rock was a bit more treacherous than I expected. I swear I walked about a mile from Little Corona Beach, and I’m glad I wore hiking shoes instead of flip flops, as it wasn’t easy. At high tide, it would be downright impossible to get out there. It was well worth it, as even on a gorgeous sunset evening on a busy holiday, there were only a couple of surfers who left as we arrived. Contrast that with Little Corona Beach, which was packed with people. At was a beautiful scene, and really nice way to start the New Year. I have to say I’m a bit disappointed with my photos from the evening, though. I should have easily walked away with 5+ keepers, but everything is sorta “meh.” Even this shot suffers from where I decided to stand and the height of my tripod, which cause the cool arch to be mostly clipped in the photo. Rookie mistake. Along those lines, I feel like I’ve been in a bit of a rut as of late. Despite beautiful, snowy conditions in Yosemite, I don’t think I came away with anything great from that trip in December (and still haven’t edited a single photo). On recent trips to the beach, I’ve left my camera at home, too. I’m hoping to bust out of this soon and start the year out strong with some good photos, but haven’t had success thus far. Hopefully editing some old photos and posting here will help! This photo was taken by me with my Nikon D810 and Nikon 14-24mm f/2.8 lens. I also used my MeFoto travel tripod. If you’re planning a California road trip or vacation, check out my California category of posts for other things to see and do. For photo licensing inquires, please contact me. 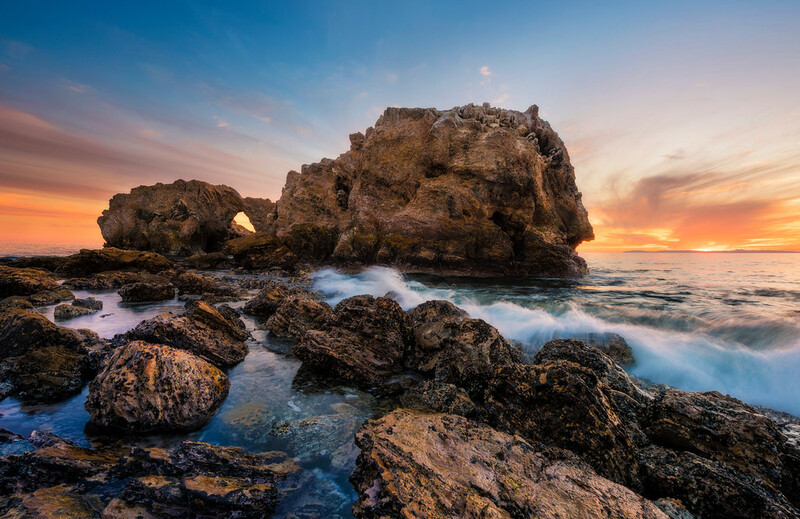 Have you been to Corona del Mar? Hiked out to this Arch Rock? What do you think of it? Have any questions or other thoughts? Please share below in the comments! Hi Tom! I randomly came across this page while searching for images of Corona del Mar to find some good photo opp locations. First off, my maiden name is Bricker so I was surprised when I saw your name! Secondly, your shot is great and I was wondering how you actually got down to the spot where you took this photo. I will be in town for one night coming up for a commercial shoot and wanted to pop down here and try to get a sunset photo. I know you had to walk from Little Corona Beach, but is there another closer public access area? I looked on Google Earth and it seems like there is a path from Brighton Rd to the left of your dream home! Is that locked? Or accessible to the public? Any help would be much appreciated! Thanks so much. Good shot. But what inquiring minds, (OK maybe just me) really want to know is when will Yoho pt 1 drop? Haha, oops, I’ve fallen a bit behind with the start of the new year. That and plenty of other posts are in the pipeline, I swear! Beautiful shot, Tom. This is definitely a tricky location as it involves trying to get out there when the tide is not too low, or too high and it works a lot better with a killer sky. Trying to get those factors to line up on a night when I can actually get down there is probably going to take several attempts. Hopefully your new Sony will help you out of your photographic funk. I feel like I’ve been chasing my tail lately and sometimes wonder if the universe is conspiring to keep me from getting my shots. I literally was on my way down to Corona Del Mar again tonight with a killer sky…except as I drove down the 55 all of the clouds cleared away from Costa Mesa. Killer sunset to the North and South, but jack diddly squat in Newport, so I made a U turn and went home. And I’m now 0 for 5 at Badwater in Death Valley. Each of those 5 times had incredible potential and at game time, the clouds went away. Here’s hoping we get killer conditions at Yosemite in February. I’d say we are both due for some epic conditions! Law of averages…right? It’s been a couple of weeks since your comment, and I’d say you played your “law of averages” card on that killer Malibu sunset. I’m still cursing you for that! Oh my goodness…I was at Corona del Mar on New Year’s as well. I think I was in a different spot. Hope you got some good shots–it was a great sunset!